Ask these nine essential questions before buying an anti-fatigue mat. GOOD ergonomics is good business. According to a November 2003 productivity study in the Journal of the American Medical Association (JAMA), lost productive time from common pain conditions among active U.S. workers costs an estimated $61.2 billion per year while at work and in work-related absences. The use of ergonomic or anti-fatigue matting is considered a critical means to alleviating the pain associated with standing work. As a result, it increases productivity and reduces the exposure to labor and industry claims. One company that takes the effects of standing work seriously is Precor, a manufacturer of premium fitness equipment for homes and fitness facilities. Headquartered in Washington State, Precor was honored with the first-ever Ergonomics in Action award from the Washington State Department of Labor and Industries for taking the lead in applying ergonomic principles to increase the simplicity and safety of its workplace. Precor has willingly taken steps to protect its employees from injuries; as a result, workers are less fatigued and more efficient. Additionally, Precor makes a point of noting that safety has a bottom-line impact on profitability. Precor's production facilities are among featured workplaces on the Washington agency's Web site about ergonomics best practices (www.lni.wa.gov/Safety/Topics/Ergonomics/Success/Demo/default.asp). Harlan Anderson, Precor's director of operations, said the key to being able to work efficiently, effectively, and safely over a 10-hour shift is having the right equipment and comfortable standing and working environments, which he regularly evaluates. "Safety is a big deal," said Anderson. "We ordered generic foam mats from a catalog for a long time but found that they got ripped and worn easily. So, for the company, durability is a benefit. At the same time, the workers are very appreciative of the performance and safety of the . . . anti-fatigue mats." How should you go about evaluating anti-fatigue matting and implementing a working surface that offers the best health and safety benefits, as well as the best value? Here are nine essential questions to consider before buying anti-fatigue matting that apply to any product, regardless of the manufacturer. These questions are based on a broad analysis of research data relating to the effectiveness of standing and working surfaces and their impact on reducing fatigue and injury and increasing productivity. Question 1. Has the mat been optimized for softness and hardness? The compressibility of a material is a global measure of mat firmness and is one of the most important test results in evaluating product performance. It is measured in Mega Pascals (MPa), a measurement of pressure, with the optimal range of firmness to reduce fatigue between .6 and .9 MPa. A standing surface that is too soft can increase fatigue (example: standing on a mattress); a surface that is too hard or bottoms out easily may be only slightly better than standing on nothing and will likely get worse as it wears out. Many so-called ergonomic and anti-fatigue mats claim to be the softest or plushest in the market. These mats fall well outside the optimal parameters for reducing fatigue and actually may increase fatigue and the likelihood of injury because of surface instability that causes excessive body sway or lower-extremity shifting over time. Usually, thicker, softer matting material creates a greater trip hazard and wears out more quickly. Softer isn't necessarily better when it comes to reducing fatigue and injury. Question 2. Does the mat provide an adequate balance between instability and stability? There must be enough instability to encourage small postural changes that facilitate increased blood flow to and from working muscles, but not so much that it requires excessive muscular activity that might accelerate fatigue. Extreme levels of instability, caused by overly soft mats, increase the risk of loss of balance and affect overall body posture. Too much instability can increase subtle additional muscular activity as the body works to retain balance, accelerating fatigue levels. Fatigue-induced deterioration in elastic modulus (balance) may lead to an increased risk of slips, falls, and workplace accidents when workers are tired or experiencing discomfort. Additionally, too much instability can cause or worsen musculoskeletal conditions in the back, hips, knees, ankles, and feet and can create painful, debilitating conditions such as plantar faciaitis. Question 3. Does the mat resist bottoming out without being too soft? Although a surface may have adequate compressibility, it also must be appropriately thick. A mat that is too soft and easily bottoms out begins to act like a mat that is too hard because the cushioning material becomes fully compressed. Current data suggests mats should have a bottoming out depth greater than 5 mm and a thickness greater than 10 mm. Known in the industry as the densification strain (bottoming out point as a percentage of thickness), it must exceed 50 percent to produce the best results, unless the mat is too soft. In other words, a mat may have an appropriate ratio of thickness/bottoming-out depth, but if it is too soft this value becomes unimportant because of the overriding problems associated with mats that are too soft. Optimal bottoming-out depth works in concert with an optimal balance of stability and instability, and optimal compressibility. Question 4. Does the mat adequately respond to worker movements? A responsive mat should rapidly return to its original shape as weight is shifted. If a mat has a delayed rebound, it will likely already be partially compressed as a load is repeatedly placed on it, reducing its ability to provide the most effective benefit of its elastic modulus. A surface that is slow to respond is prone to bottoming out. If the return is actually in phase with the movement, less energy may be used as the mat helps with movement, much like a spring. Adequate responsiveness works in concert with optimal bottoming-out depth, optimal balance of stability and instability, and optimal compressibility. Question 5. Does the mat balance shock attenuation and resilience (absorb and return energy)? The ability to attenuate or absorb shock without bottoming out ensures the impact of falls and sudden movements on the mat is cushioned adequately without causing injury. Too much absorption, however, may create the same sensation as standing in sand, which may absorb shock but is very uncomfortable as a working surface. When balanced with the right amount of elasticity (resilience), a mat can result in less discomfort. Question 6. Does the mat get softer as it is compressed? 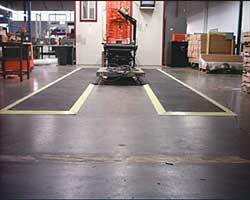 A popular yet faulty logic indicates that if a hard surface is bad to stand on, then a soft surface is good. In response to this erroneous assumption, many mat surfaces are constructed from foam materials. Regardless of the variations in construction, from domed foam geometries to draped top-covers with various surface textures, there is one challenge shared by all foam-based mats: Foam gets harder as it is compressed. So if the objective is merely to provide a softer surface, why do it with a material that gets harder when workers walk or stand on it? On the other hand, some mats are made of difficult-to-compress materials and lack the advantage of compressibility provided by foam. Question 7. Does the mat resist movement under use? A clean, dry floor is one of the best deterrents to a sliding mat, but this is not always possible. The material from which a mat is made also can contribute to a mat that moves easily across the floor. Some foam formulations break down readily, creating a slippery layer of fine dust between the mat and the floor. If these mats are draped with a hard finish, the user may be unaware of the degradation of the material because the top surface still may look new. Also, many mats are very lightweight, shift easily, and become a trip hazard as items roll over them or as they are kicked or bumped. Question 8. Is the mat easy to clean? Foam-based mats; mats with rough, domed, or uneven surfaces; or mats with through-holes may be difficult to clean and can absorb moisture or trap foreign matter, which leads to unsanitary and unsightly conditions. In food preparation areas, especially where heavy wear and tear occurs, foam mats that are sliced, cut, or torn can easily trap food particles and bacteria in their ruptured foam cells that are almost impossible to thoroughly clean. Health inspectors may react harshly to this unsanitary situation. Mats made of material other than closed-cell foam tend to be easier to clean if sliced, cut, or torn. Question 9. Is the mat durable? The real value of an anti-fatigue solution may be more apparent when analyzing the number of replacement cycles that result over a specified time period. Many mats are replaced after only a few months or a few years because of damage. Although it may not be visible to the naked eye, the thin cell walls of foam mats can rupture and lose their elasticity with use, leading to an overly soft condition and a mat that easily bottoms out. Foam can break down, become ragged, and fall apart over time. Also, many mats today are prone to edge damage because of thin edges or the softness of their material. Draped top-covers can curl and tear as they become brittle. Mats with damaged edges create a trip hazard and should be replaced. The edge system of a mat should be designed to be durable so it is not easily damaged. Precor's Anderson said the mats they chose "have eliminated trip hazards associated with individual mats that move around. We really like the yellow transition ramps. With the eight-year warranty we won't need to replace them as often, which is a great long-term value." Research has enabled us to create a new generation of technology that not only saves us money, but also can truly reduce fatigue and injuries while increasing productivity, which is where the real value resides.